Thanks to CIBC First Caribbean who supported United Caribbean Trust in purchasing Sawyer PointOne Water Filtration Systems in Haiti following hurricane Matthew in 2016. 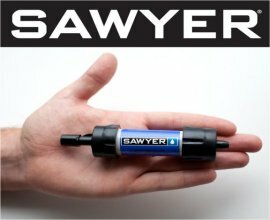 The Sawyer Point One Filter is the fastest, easiest and most cost efficient way to get safe drinking water especially for large organizations because it can produce up to 300 gallons of drinking water a day, cleaner than US bottled water anywhere in the world! 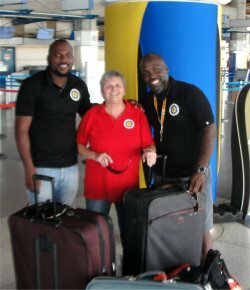 The United Caribbean Team - Imran Richards and Nigel Jules are seen off at the Barbados airport by the founder of UCT - Jenny Tryhane. 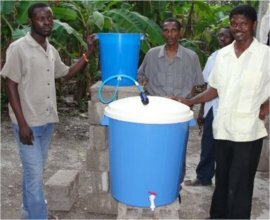 CLICK to view the Sawyer Water Filter distribution in Haiti. The Haiti cholera epidemic has rocked the Western Hemisphere's poorest nation with another emergency to deal with following the catastrophic earthquake that killed more than a three hundred thousand people and left millions homeless with many still living in tents six years later! 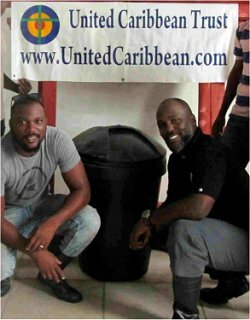 During the earthquake United Caribbean Trust (UCT), a Barbadian registered charity #842, focused on relief supplies and clean water distribution. 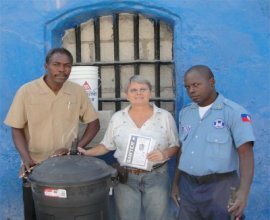 As many will remember Jenny Tryhane, the founder, was in Haiti during the earthquake and stayed on for 3 months to distribute three 40 foot containers donated by the generous people in Barbados. Now Haiti has being impacted not only by another outbreak of cholera but hurricane Matthew with 140 mph winds and 20 inches of rain. Les Cayes, where UCT has its main headquarters, is one of the hardest-hit towns on the southwest coast of Haiti. 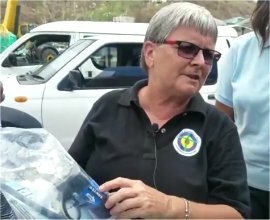 Seen here in Haiti in Les Cayes one of the worst affected areas in the country, giving out the Sawyer PointOne Water filters following hurricane Matthew. Unicef warned. This is the worst storm Haiti has seen in decades, and the damage will no doubt be significant, said Marc Vincent, the Unicef representative in Haiti. Waterborne diseases are the first threat to children in similar situations. Our first priority is to make sure children have enough safe water. Haiti is facing a surge in cholera cases in the wake of Hurricane Matthew, doctors warned as the death toll on the devastated island climbed past 1,000. Following the earthquake in 2010 UCT distributed over 250 Sawyer PointOne filters into schools, orphanages, St Marc Prison, slums such as City Soleil and hundreds of churches.